The Stansted Maple Parking Park and Ride is two minutes from the terminal and a stone’s throw from the Premier Inn and Holiday Inn Express Hotels. It’s open 24/7 and has a dedicated transfer bus that runs on-demand and ships you to check-in swiftly. Staff keep your keys while you’re away and place your car in a secure car park that’s Park Mark accredited. Call their customer-focused staff when you return and they’ll advise you of the pick-up zone for that particular day. It’s often forecourt Zone C, but can sometimes change to another convenient location. 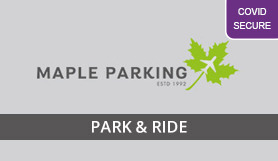 You won’t struggle to find Maple Parking Park and Ride at Stansted. Set your Sat Nav for Maple Parking, adjacent to Holiday Inn Express, Thremhall Avenue, CM24 1PY for a smooth arrival. When you want a high-class airport parking service from an experienced firm, Maple Parking fits the bill. This service was previously known as Maple Manor Parking. free transfer is for a maximum of 4 pax per vehicle booked. If you have more than 4 pax, please contact Maple on the number given on your confirmation. Once you have arrived at Thremhall Avenue, please enter the car park and park up on the right hand side near to our reception / Portakabin. Your keys will be taken and your car inspected before it is parked for the duration of your trip. Our transfer bus runs on demand and takes 3 minutes to the airport. After clearing customs, please call to advise that you are ready for collection, then proceed to the forecourt, Zone C – Just in front of the Terminal Building. *Meeting point is subject to change on the day by Stansted Airport – you will be informed if this is the case when you call. From the M11 – Please follow directions below.